GIBBON (The Geometry and Image-Based Bioengineering add-On) is an open-source MATLAB toolbox for segmentation, image-based modeling, visualization, meshing, and finite element analysis. 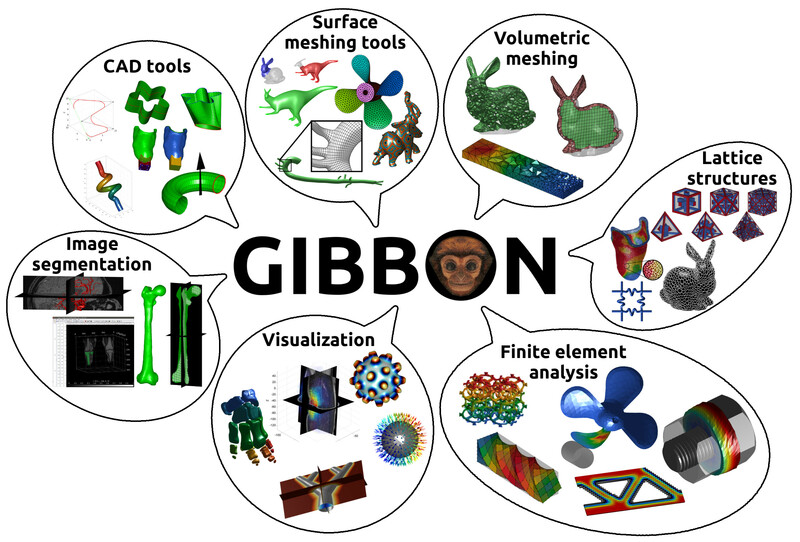 GIBBON includes an array of image and geometry visualization and processing tools and is interfaced with free open source software such as TetGen, for robust tetrahedral meshing, and FEBio for finite element analysis. The combination provides a highly flexible image-based modelling environment and enables advanced inverse finite element analysis. The imx.m function provides a graphical user interface for segmenting 3D image data. The demo below stems from: HELP_imx. Multi-material tetrahedral meshing is enabled using TetGen. The TetGen interface is based on the runTetGen.m function. The demo below comes from the help file HELP_runTetGen. Finite element analysis is enabled through the FEBio interface (see also the runMonitorFEBio function. The image below is for large strain analysis of a twisting bar and stems from the demo DEMO_FEBio_bar_twist. Other DEMO_FEBio_... files cover uni-axial tension/compression, bending, indentation, viscoelastic analysis, contact and indentation problems, multi-generational materials for pre-load analysis. GIBBON uses a custom figure type called cFigure. It contains a white background, is maximized by default, and includes a view control widget (vcw) and an export figure widget (efw). The vcw function enables 3D view control similar to CAD packages. Rotation, zooming, and panning can be performed using a 3 button “mouse” (or equivalent input device), e.g. middle-click rotates the view, left click drags/moves the view, right click allows zooming in and out.